If you're looking for a simple, error-proof way to do iPhone full restore on your iPhone, this article is for you. Maybe you're having serious problems with your iPhone , or maybe you're getting ready to sell your iPhone and want to make sure all of your information is cleared. Whatever your reasons, know that once you complete iPhone full restore, there's no going back. All of your information, settings, everything will be gone with no possibility of reclaiming it. If this is what you're looking for, there's a very simple way to accomplish it. Reset or Restore – Which One Is For You? But first, let's make sure iPhone full restore is really what you need, instead of a less-extreme reset. A reset will simply return your iPhone to its original factory settings. If you're having a lesser problem with your iPhone (for instance, can't change a certain setting or connect to networks properly), a reset may be the way to fix it. Glitches and unexplained peculiarities in an iPhone can often be corrected using the reset option. iPhone full restore, on the other hand, is the last-ditch effort at solving a major problem with your iPhone's operation. Think these two options in terms of house cleaning. A reset means cleaning a room (tidying up, vacuuming, etc. ), while iPhone full restore means emptying it of all furniture and items so it looks like it did on the day you first moved in. If you've tried everything else to fix your iPhone, or if you're selling it to someone else, iPhone full restore is what you want. Since iPhone itself does not have the option for a full restore, prepare iMyFone Umate Pro or iMyFone Umate Pro for Mac on your computer to get ready for a full restore. iMyFone Umate Pro is a comprehensive, easy-to-use program that allows you to fully restore or reset your iPhone. 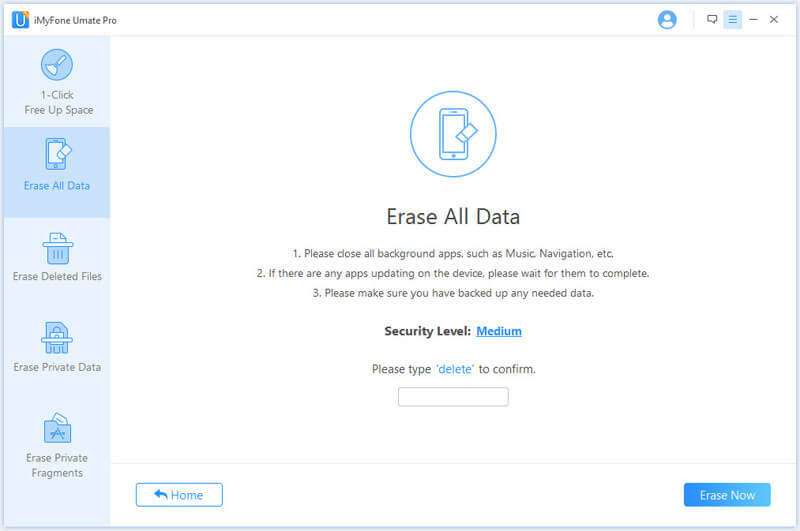 On Umate Pro, to do iPhone full restore, you can to “Erase All Data” tab. When you perform iPhone full restore, there is no going back and no possibility to retrieve data or files erased. You can erase just your private files, or all files, including erasing your already deleted files. You can choose what to erase from your iPhone with a few clicks instead of a series of complicated steps and multiple password sign ins. After you've installed iMyFone Umate Pro, simply follow three easy steps to fully restore your iPhone (Kindly reminded, back up your iPhone data or some important files first). 1. 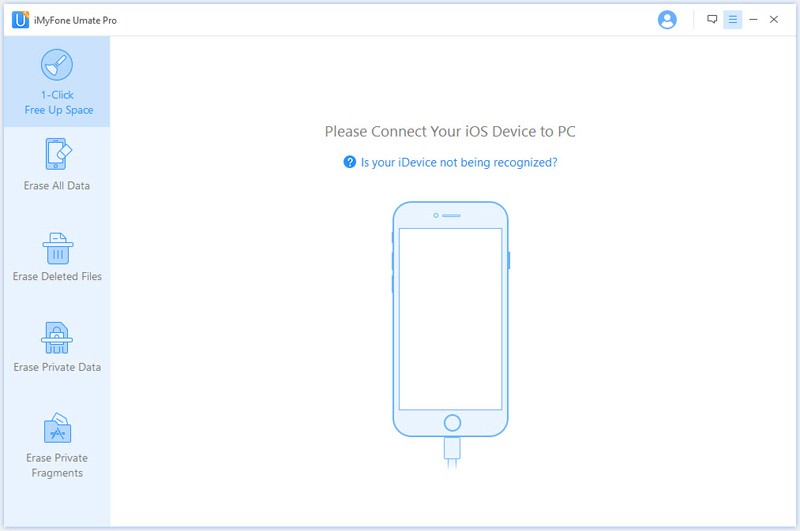 Connect your iPhone to the computer and launch iMyFone Umate Pro. 2. Go to “Erase All Data” tab and hit “Erase” button. 3. Type “delete” into the box to confirm and hit “Erase Now” button to start. That's all there is to it. 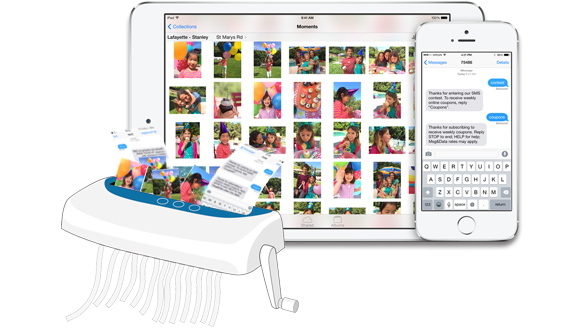 No hassle or multi-step process; it's as easy as 1-2-3.
iMyFone Umate Pro is good for a number of other cleanup related functions besides just restoring your iPhone. 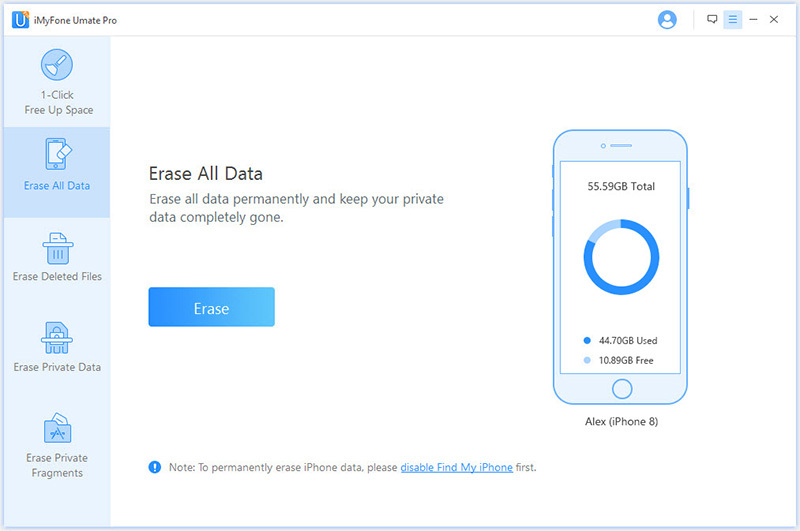 Erase Private Data: For instance, if you decide now or in the future that you don't need iPhone full restore, you can use the same erasure to destroy your private data, 100% unrecoverable. If you aren't sure that iPhone full restore is necessary, it's definitely best to start out with this option. 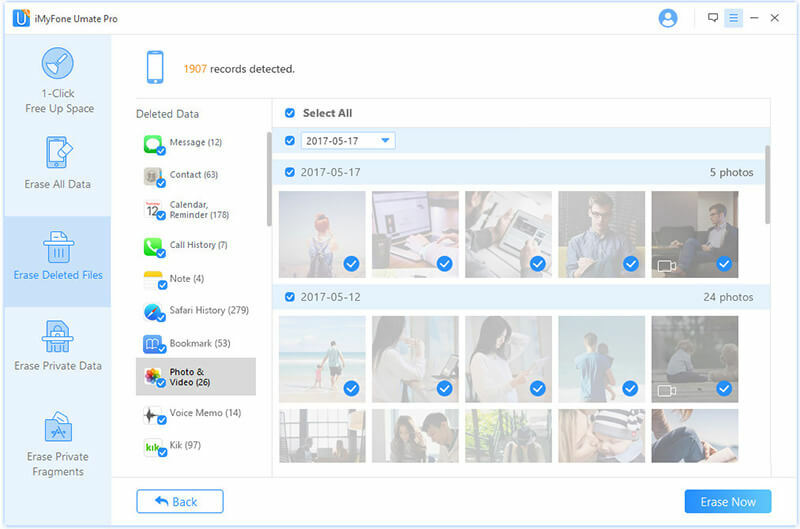 Erase Deleted Files: If you have already deleted some personal data from your iPhone and worry about data deleted will be retrieved by bad hand, you can come to iMyFone to find out the previously deleted files and completely destroy them. 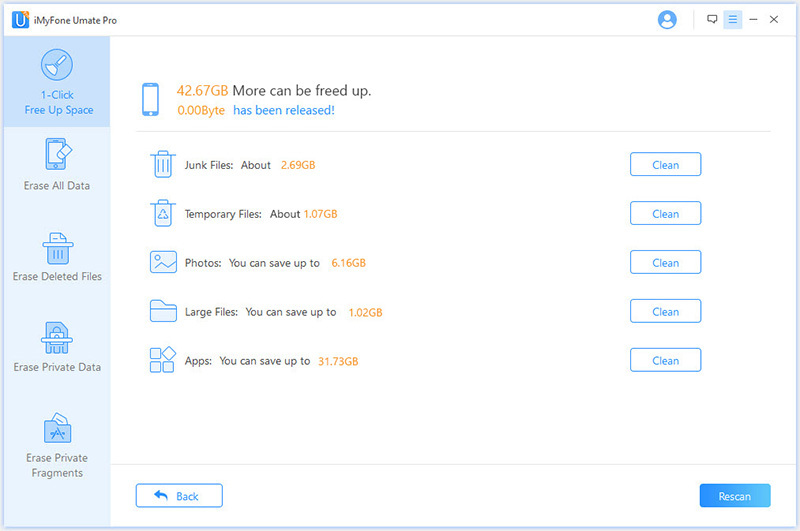 1-Click Free Up Space: It allows you to make more space on your iPhone with a single click. 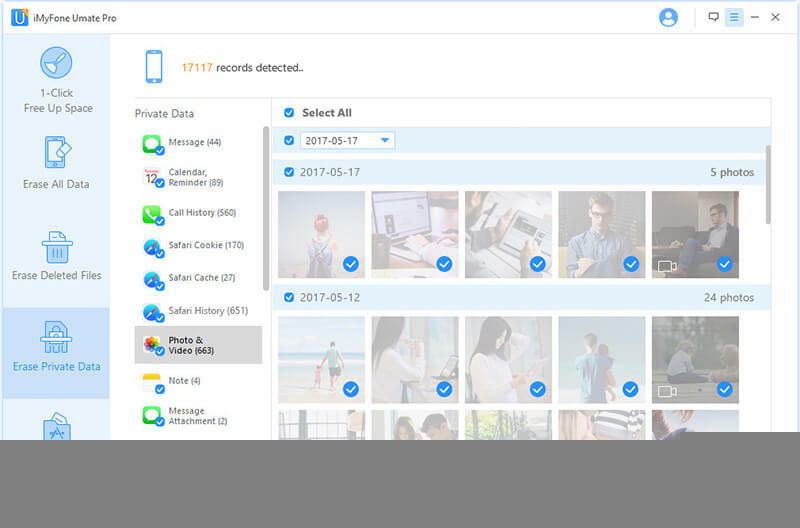 In just one motion, you can delete all unnecessary files and compress photos and larger files whenever you need more storage room. Imagine never having to scroll through your pictures and music files, hurriedly deleting your personal things to make more room again. Umate Pro makes it easy to take control of your iPhone and your data one more. Don't waste your time trying to reset your iPhone the hard way. Use iMyFone Umate Pro for iPhone full restore is much more safer and simpler.